need to walk out and turn left. The helpful klook team is waiting. travel tip: download and install GO-JEK app for taxi and transfers. 1/3rd the price and you can pay cash to the driver. Connect with family and friends and tell them all about the exciting vacation you are having in Bali without exorbitant roaming costs with the 30 day data Bali SIM card. Enjoy super fast web speeds, get your Facebook updates, make travel arrangements, post pictures and more. 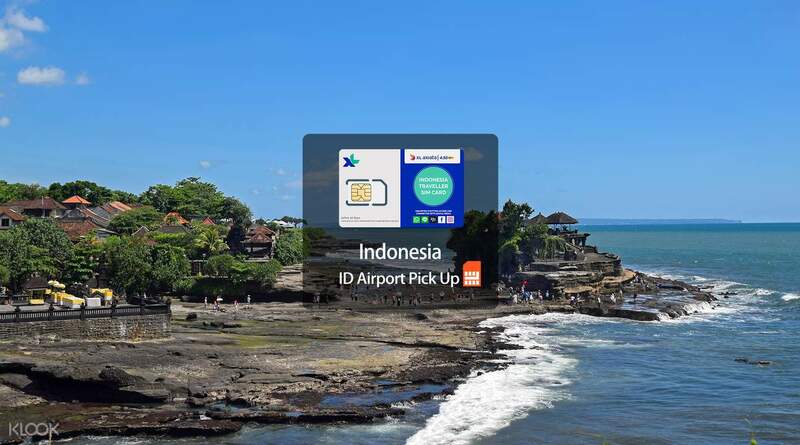 Available for pick up right when you arrive at the airport, the Bali tourist SIM card will let you connect to 4G or 3G network (depending on the area) so you can make the most of your vacation without worrying about the details. There were guys wearing orange with Klook sign right outside the arrival area of the airport. They helped put the sim for me and my friend. As to the signal it was perfectly working and I got to use the free call credits to contact the driver we hired for the private tour which we also booked thru Klook. We availed Bedugul, Ubud, and east tour, internet was fine in all areas. Thank you Klook for this offer! There were guys wearing orange with Klook sign right outside the arrival area of the airport. They helped put the sim for me and my friend. As to the signal it was perfectly working and I got to use the free call credits to contact the driver we hired for the private tour which we also booked thru Klook. We availed Bedugul, Ubud, and east tour, internet was fine in all areas. Thank you Klook for this offer! Easy and quick! Procedure was simple. Just look out for klook at arrivals, show your voucher to exchange for SIM, slide SIM into phone everything works perfectly! I’m on Instagram 24/7 when i travel, 6GB was more than enough for my week! Highly recommended!! Easy and quick! Procedure was simple. Just look out for klook at arrivals, show your voucher to exchange for SIM, slide SIM into phone everything works perfectly! I’m on Instagram 24/7 when i travel, 6GB was more than enough for my week! Highly recommended!! I’m very happy the Klook people waited for me outside of the airport arrival hall even I’m delayed 55mins. I also booked a car to my guest house and the driver waiting together with the SIM card staff. The sim is good for internet coverage even in the hot spring or middle of the forest. I’ve no problem using it via my mobile network and also via a internet donger ... in my room sometimes it is G coverage and sometimes 3G shown in my mobile. When I use my donger it is good and smooth. Overall experience is worth while and satisfying. I’m very happy the Klook people waited for me outside of the airport arrival hall even I’m delayed 55mins. I also booked a car to my guest house and the driver waiting together with the SIM card staff. The sim is good for internet coverage even in the hot spring or middle of the forest. I’ve no problem using it via my mobile network and also via a internet donger ... in my room sometimes it is G coverage and sometimes 3G shown in my mobile. When I use my donger it is good and smooth. Overall experience is worth while and satisfying. We arrived at the airport in the morning and the Klook agent was already at the waiting area. Transaction is fast and the sim is worth the price. Some areas in Bali are in 3G but most tourist attractions have 4G connections. We arrived at the airport in the morning and the Klook agent was already at the waiting area. Transaction is fast and the sim is worth the price. Some areas in Bali are in 3G but most tourist attractions have 4G connections. Located the Klook team immediately. They gave me the sim and helped me unlock the SIM card slot. No need to register or restart your phone. After inserting the sim, I turned my data on and it automatically connected to the internet. Reception was good and the free call and texts were helpful. My brother bought a sim from a local mart and it was more expensive and it wasn’t unlimited like this one. Located the Klook team immediately. They gave me the sim and helped me unlock the SIM card slot. No need to register or restart your phone. After inserting the sim, I turned my data on and it automatically connected to the internet. Reception was good and the free call and texts were helpful. My brother bought a sim from a local mart and it was more expensive and it wasn’t unlimited like this one. Claiming was easy and the sim card was waaaaay cheaper than those available at the airport. Make sure to book before going to Bali! Guys were there 24/7 near the driver's area. Claiming was easy and the sim card was waaaaay cheaper than those available at the airport. Make sure to book before going to Bali! Guys were there 24/7 near the driver's area. Hassle-free redeption of sim upon arrival at the airport. So satisfied with the fast and stable connection. Stayed connected wherever I go. Highly recommended indeed! Hassle-free redeption of sim upon arrival at the airport. So satisfied with the fast and stable connection. Stayed connected wherever I go. Highly recommended indeed! it was a good experience and it was done when i reavhed here in bali i got the sim cards on the airport and without any hassale it got activated in a minute. it was a good experience and it was done when i reavhed here in bali i got the sim cards on the airport and without any hassale it got activated in a minute. Network lasted me for my 10 days trip! Worked pretty well in Bali and Yogyakarta. Signal was on and off in Nusa Penida but still good. And we got the 1-1 deal so it was pretty worth! Network lasted me for my 10 days trip! Worked pretty well in Bali and Yogyakarta. Signal was on and off in Nusa Penida but still good. And we got the 1-1 deal so it was pretty worth! Got the sim card from the Klook staff and ready to use when we exited the airport immediately. Fuss free and sim card can be easily activated when inserted. Got the sim card from the Klook staff and ready to use when we exited the airport immediately. Fuss free and sim card can be easily activated when inserted.